D & M Communications, Inc. With communication becoming more and more digital, you need to ensure the best possible patch panel installation. Regardless of the size of your business, D&M Communications can customize the ideal network patch panel set up to optimize your computer/communication network. You have so much invested in your company; make sure you trust it to an industry-leading expert. 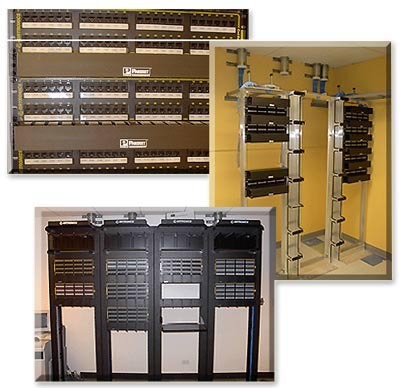 D&M Communications offers a variety of network patch panel set-up options. One common design for your installation is to mount your network patch panel in a secure place such as a wiring closet or switch room. This allows for safe patch panel installation and ensures the security of your connections. If you have a smaller business without an area to commit to your network patch panel, we can design your network panel to resemble a power strip. This small, discreet panel network is ideal for companies with less room and small computer and communications devices to link together. Regardless of the size of the project, D&M communication will find the right solution for you and your network patch panel needs. Contact us today to discuss your needs and schedule a free consultation and site review!